Dimensions (HxWxD): 1.5" x 3" x 1.5"
These wonderful Rainbow Fluorite Bowls are each polished and translucent with an average diameter of two inches, so each one is large enough to hold a small flower or more simply, water, and can be placed on your altar or a display shelf or window sill in your home. These are what we call "seconds" because they aren't up to our highest standards due to the presence of some matrix in the bowl or some of them don't have as 'organized' a patterning of what we've come to love in the Rainbow Fluorites. 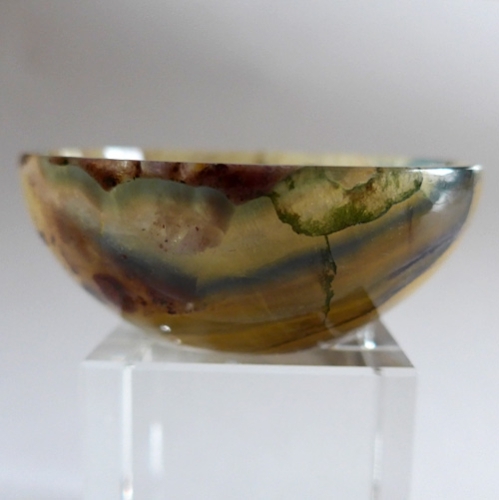 Click here if you prefer the regular Rainbow Fluorite 2" Bowls. I have been looking for gem crystal bowls for offerings on our altar for a long time and was thrilled to finally find a wonderful supplier for these beauties, made in India, each piece is unique & amazing. We use them on our altar to hold flowers, water & also to hold small gemstones which we work with in meditation such as phenacite, apatite, topaz and small specimens of tourmaline. 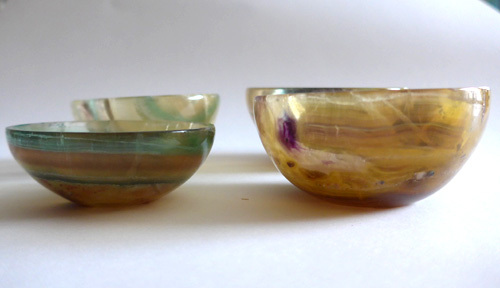 These gorgeous striped Fluorite Bowls are cut & polished with beautiful patterns & a rich golden hue overall adding to the vibrant color. Many have striped markings & even ibits of matrix visible in part of the bowl. Each one emanates a lovely golden-violet glow offering assistance to the crown chakra and assisting us to connect with the Divine World. Each piece will differ slightly from the appearance here as each one is hand cut, and each one is beautiful and guaranteed to meet with your satisfaction. Another wonderful use to which we put these treasures, is to use them to make gem elixirs, either in the morning dawn, infused in moonlight or even in the sun, depending on the purpose to which you are putting the elixir. We don't recommend drinking the water directly placed in the bowl. If you want to make elixirs, we always recommend you place the bowl on top of a mason jar of charged water. Fluorite often occurs in glassy bands found in a variety of mineral environements. Fluorite is commonly found in metallic hydrothermal deposits associated with lead, silver, galena, sphalerite, or cobalt deposits. Fluorite is often found in hydro-thermal deposits such as areas with hot springs, where porous limestone has been infused with aqueous fluoride. Rainbow fluorite contains blue, blue-green, green, turquoise, royal blue, purple, and lavender markings, often seen in layers, as in this beautiful specimen. Fluorite is said by crystal healers to enhance our powers of discernment, and help us reach a balance in relationships. All colors of fluorite are effective for clearing the aura and energy centers and can facilitate a deep state of meditation. Blue or turquoise fluorite soothes and energizes the throat chakra, while green fluorite opens and energizes the heart chakra, and purple or lavender fluorite activates the crown chakra. Yellow and orange fluorite energizes the second chakra, governing our sexual energy and the third chakra, increasing our sense of worth and personal power. We know you will use this powerful crystal with loving wisdom and respect its journey in the Earth for many long historical cycles which has developed its unique metaphysical properties and beautiful appearance. Note: Average weight is 4.65 oz. Average dimensions listed above. Each piece has a unique mix of beautiful colors and is guaranteed to be beautiful & to meet with your complete satisfaction! These are hand made in India and we've included a group shot to give you an idea of how these bowls can vary from piece to piece. 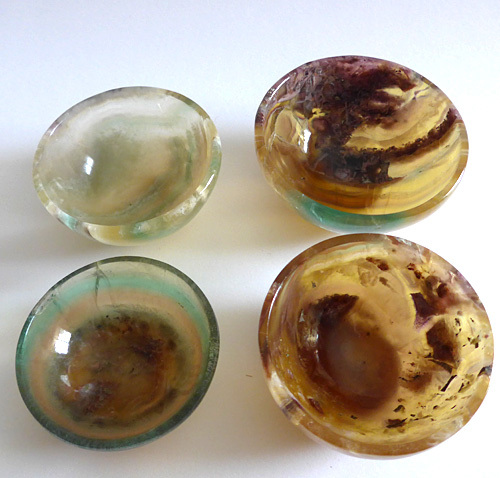 A choice of the rought material is chosen, then cut and polished bringing forth the colors and patterns unique to each piece of natural fluorite stone. Enjoy!